Last month, Consumer Action and other members of the Los Angeles #StopTheDebtTrap coalition joined Los Angeles County Supervisor Hilda L. Solis at a press conference at the Los Angeles County Hall of Administration to announce support of stronger federal consumer protections against payday, vehicle title and other damaging high-cost installment loans. The action comes at a critical time, as the Consumer Financial Protection Bureau (CFPB) is proposing a rule to rein in the out-of-control short-term loan industry, which is notorious for offering 300%+ interest rate loans to low-income, vulnerable people with nowhere else to turn. Localities like Los Angeles County are taking action too: On Sept. 13, the Los Angeles County Board of Supervisors unanimously approved a motion by Supervisor Solis in support of strong CFPB rules to better protect consumers from payday loan abuses, making Los Angeles County the largest county in California (and the U.S.) to do so. Consumer Action’s Community Outreach and Training Manager Linda Williams was front and center at the press conference, which was organized by Liana Molina, director of community engagement at the California Reinvestment Coalition. Williams proudly displayed a sign that read #StopTheDebtTrap (the coalition name and a trending hashtag on Twitter, flagging opposition to the payday industry). Prior to the press conference, Williams worked behind the scenes, making calls to Consumer Action’s partners to speak with clients who had been devastated by payday and auto title lending and to encourage them to attend the conference to tell their stories. 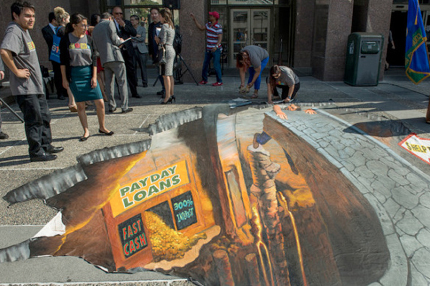 Conference speakers were flanked by a visually stunning, life-sized 3D art installation called the “Pit of Despair.” The pit, which appears to be opening up into the street itself, demonstrates how easy it is to fall into the “debt trap” that a majority of payday loan borrowers find themselves in when they are unable to make high-interest payments. Rabbi Joel Thal Simonds, associate program director at the DC-based Religious Action Center of Reform Judaism, introduced Supervisor Solis and opened the press conference with a quote reminding the public of the words of Exodus 22:25: “If you lend money to my people, to the poor among you, do not act toward them as a creditor; exact no interest from them.” Rabbi Simonds, who spoke on behalf of the coalition, stated (in accordance with the spirit of these principles) that the coalition seeks a just and caring society in which those in need are not set on a downward spiral of debt and hopelessness. The CFPB’s proposed rules, would, if adopted, go into effect nationally in June of 2017. The rules would require lenders to take steps to ensure that consumers have the ability to repay the loans they are seeking. Despite being a step in the right direction, advocates warn that the CFPB’s proposed rule contains dangerous exceptions that would allow lenders to evade the intent of the regulations. For instance, despite the fact that even one high-interest loan can bury borrowers in debt, as it stands now, the proposal would allow six payday loans per lender per year. You can help support the CFPB in implementing a strong rule by submitting a comment today.